There is another aspect to the mechanism of overt acts. 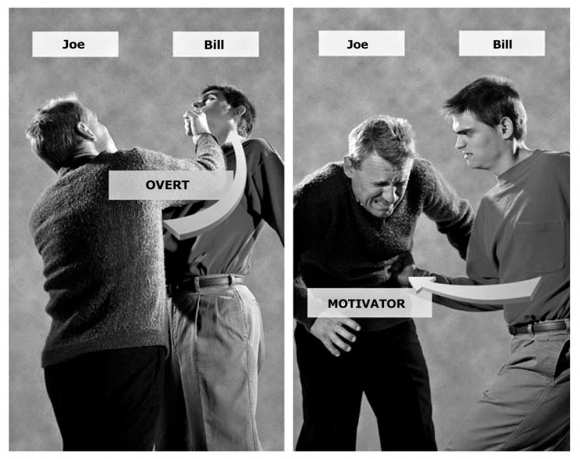 It is called the overt–motivator sequence, and it further explains much of human behavior. An overt, as seen, is a transgression against the moral code of a group and could additionally be described as an aggressive or destructive act by the individual against some part of life. A motivator is an aggressive or destructive act received by the person or part of life. The viewpoint from which the act is viewed resolves whether the act is an overt or a motivator. The reason it is called a “motivator” is because it tends to prompt that one pays it back—it “motivates” a new overt. When one has received something bad, he also may tend to feel he must have done something to deserve it. The above points are true. The actions and reactions of people on the subject are often very falsified. People go about believing they were in an auto accident when in actual fact they caused one. Also people may believe they caused an accident when they were only in one. Some people, on hearing of a death, at once believe they must have killed the person even though they were far away. Police in large cities have people turn up and confess to almost every murder as a routine. One doesn’t have to be crazy to be subject to the overt–motivator sequence. The overt–motivator sequence is based upon and is in agreement with Newton’s law of interaction that for every action there is an equal and contrary reaction. The plain law of interaction is that if you have two balls, a red one and a yellow one, suspended by strings and you take the red ball and drop it against the yellow ball, the yellow ball is going to come back and hit the red ball. That is Newton’s law of interaction at work. People who have gone down (deteriorated) and are beginning to follow totally the physical universe use this law as their exclusive method of operation. There is more to the overt–motivator sequence, however, than just Newton’s law of interaction. If Joe hits Bill, he now believes he should be hit by Bill. More importantly, he will actually get a somatic (a physical pain or discomfort) to prove he has been hit by Bill, even though Bill hasn’t hit him. He will make this law true regardless of the actual circumstances. And people go around all the time justifying, saying how they’ve been hit by Bill, hit by Bill, hit by Bill. A harmful action is either an overt or a motivator depending on the viewpoint. A motivator tends to prompt another overt (the person who got hit, Bill, is likely to hit back or seek revenge), thus involving the person in many difficulties in areas of his life where he has committed overts. Even though it hasn’t occurred, human beings on a low reactive (irrational) basis will insist that it has occurred. And that is the overt–motivator sequence. This is a very valuable thing to know. For example, if you hear a wife saying how the husband beats her every day, look under her pillow for the bat that she uses because sure as the devil, if she is saying that the yellow ball has hit the red ball, notice that the red ball had to hit the yellow ball first. This mechanism does much to explain certain human activities. an aggressive or destructive act received by the person or part of life. The reason it is called a “motivator” is because it tends to prompt that one pays it back—it “motivates” a new overt act. a reference to the third of three laws of motion formulated by English scientist and mathematician Sir Isaac Newton (1642–1727). The law of interaction deals with the forces of action and reaction (the two forces that make up the interaction between two objects): Whenever one object exerts a force on a second object, the second object exerts an equal and opposite force on the first.